Same effective active ingredient as Cutrine Plus Liquid. Many customers appreciate the easy to use granular formulation. Cutrine Plus granular is very effective on bottom growing algae. 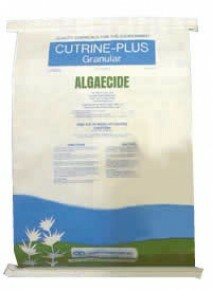 For Chara algae control (Bottom growing algae) this is our number #1 recommendation. Treat at the first signs of growth. Water can be used following treatment for swimming, fishing and irrigation. Use a hand scoop or hand spreader for even distribution. Sample 100ft x 100ft Lakeshore Lot (.23 Acre). Sample 148ft x 148ft Pond (.50 Acre). *Average amount of Cutrine required: 30 Lbs. Filamentous & Chara Control. The Cutrine Plus Granular Product Label is available for download in pdf.